Smooth, complex and robust. 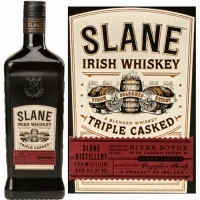 Slane Irish Whiskey marries toasted grain and malt whiskeys with the distinctive flavors of each cask. With notes of oak and spice, each sip represents is a journey through the wild countryside and the chance to uncover the subtle layers of the whiskey's complex character.